Good to see the author combining old and new characters to create a sense of continuity as Bosch is nearing the end of his career. I’ve always enjoyed Connelly’s work and I am looking forward to the next book already. If you are anything like me, once you find an author you like, you latch on and read everything that they have written. Sort of like a slow motion Netflix binge but with the downside of having to wait a year for the next episode. Unfortuntely most authors become formulaic and boring with no character development (think Clive Cussler). Not so with Michael Connelly. I have read all his novels and they just keep getting better. i just hope that Harry doesn't have his Rebus moment any time soon. Keep up the great work Michael and thanks for Renee. Very good book! I enjoyed it immensely. These two detectives work well together. I enjoy police procedural novels and this book has a good plot, a lot of suspense, and the killer is kept as a surprise to the very end. 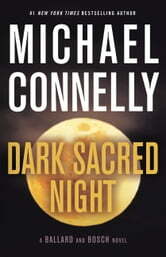 I hope Mr. Connelly will be producing many more Ballard/Bosch books. Michael Connelly never disappoints. As always, he tells a good story as Harry Bosch moves through life, in real time, giving us a complex, less than perfect, compassionate character. Absolutely loved this book. The characters work beautifully together. Have lived in LA and was able to see the city come alive. The multiple stories really came together. Was counting the time I could sit back down and continue reading again. A MUST READ!